The National Office has a selection of jewelry, apparel and other merchandise for purchase. If there is something that is not offered through the National Office or Herff Jones, email the National Office with ideas of items you would be interested in. This is to be worn around Brothers' necks during the graduation ceremony. Many chapters purchase medallions for each of their graduating members. A new tie and design were created in 2015 and feature the ΑΧΣ Coat of Arms. 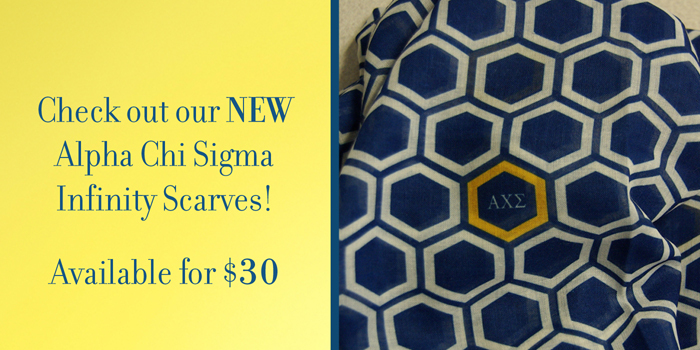 New for 2015, this lightweight continuous loop scarf is printed in blue hexagons with white borders and features yellow bordered hexagons with the ΑΧΣ letters as accents throughout. The car window clings are 18" x 1.5" and say "Alpha Chi Sigma." These durable plastic license plate frames are dark blue with "Alpha Chi Sigma" and "Professional in the Chemical Sciences" printed in yellow. Each yellow oval sticker measures 5" x 3" and is printed with "ΑΧΣ" in the middle and "Professional in Chemistry" slightly below. The National Office also takes orders for replacements of items that were already received by Brothers throughout their membership. This is the badge that all new Brothers receive at initiation. Badges are sent after all of your chapter's current pledges submit their fees to the National Office. This pin with the three Greek letters is given to all Brothers when they join the Professional Branch. To receive professional pins for graduating Brothers in your chapter, complete and submit the PBI Form to the National Office. These pins are sent when you complete each level of the Wyvern Science Outreach Program. For more information and forms, visit the bottom of the Forms and Reports page. After reviewing the available items above, complete the form. While the National Office is able to carry a few times in stock, Herff Jones is able to provide even more of a variety of items that can be ordered - from rings, tie accessories, encrusted badges, and more! R. Scott Wilson registered the Alpha Chi Sigma Tartan with The Scottish Register of Tartans. Click below to learn more about the register and how to purchase tartan merchandise. Many chapters will create their own apparel or items to sell to their members or other chapters! Just remember to submit the Promotional Items Approval Form before producing any items. Each item will need to be approved by the GMC before they are created. Selling Apparel or Items as a Fundraiser? Many chapters will create t-shirts or other promo items to sell to chapter members and other Brothers as a fundraising event. If interested, send a photo to the National Office to help publicize your chapter's items!